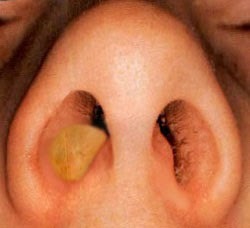 Often, patients become disturbed with the way the inside of their nose looks after a turbinate reduction to improve nasal breathing. However, many of the concerns are unfounded and the appearance though disturbing, is actually normal. It usually takes a FULL 2 weeks for the turbinate mucosa to heal to a more normal (and reduced) appearance. 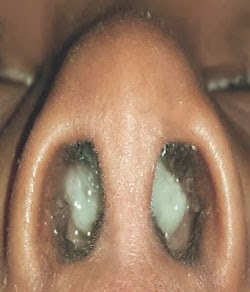 It is around 2 weeks that nasal breathing also markedly improves. In any case, during the first week, white plaques that may appear on the turbinates (picture below) are actually scabs which when wet turn white. It should be wet (and white) due to the regular use of saline nasal spray and/or flushes along with normal nasal secretions. The turbinate mucosa may also occasionally even blister (picture above/right) producing a pale appearance like the inside of a grape. These are pictures of what the inside of the nose may look like about 5-8 days after a coblation turbinate reduction. Be assured that such appearances are NORMAL and will typically resolve to a more normal appearance 2 weeks after the procedure. At that time any residual scabbing is typically removed.